DeVries clicked the “buy it now” button and acquired the postcard for $10, a bargain considering what a rare testament to the town’s early history it is. The Coquimbo, an iron-hulled sailing ship with two square-rigged masts forward and schooner rigged mast aft, was carrying a hull full of pine lumber from Gulfport, Mississippi, to Buenos Aires, Argentina, when she hit the reef. The ship’s foghorns awakened guests at the oceanfront Boynton Hotel who hastened to the waterside to see what the commotion was about. The Coquimbo was perched on a sandbar, not sinking, but there were 15 crew members stranded on board, all Scandinavian, including Captain I. Clausen. Locals crossed the canal on a skiff and built a breeches buoy to rescue all 15 men. The crew couldn’t afford to stay in the hotel so for the next two months they used the ship’s sails to make tents and camped out on the beach while they waited for the steam tugboat that would attempt to dislodge the ship. The tugboat spent days trying to budge the Coquimbo but it wouldn’t move an inch. It was destined to stay where it stood until the ocean waves tore the hull apart. In 1909 southern Florida was still pioneer country, sparsely populated with limited supplies. The town of Boynton was only 11 years old at the time with a population of less than 700 souls. A ship full of long-leaf pine lumber with beams as long as thirty feet was a figurative gold mine for the settlers. Residents collected the wood that had washed up on the beach, stacking it in piles that reached as high as fifty feet. The lumber, along with the ship’s rigging, tackle, stores and provisions would be sold at auction (scroll down to see the notice) on March 30th, 1909, but the U.S. Marshall who oversaw the sale allowed the Boynton residents to mark the piles they had made and buy them for bargain prices at the auction. 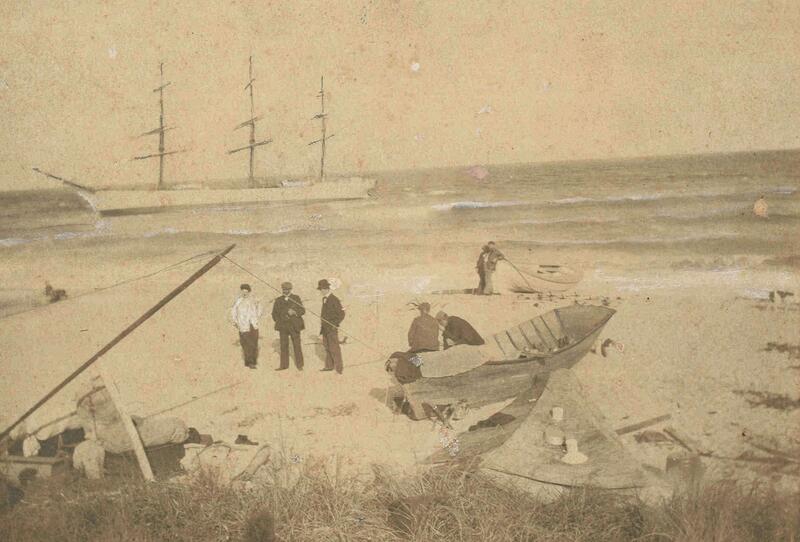 There aren’t many extant photographs of the Coquimbo. DeVries has been actively searching for pictures of the wreck for the past 20 years and this is only the fourth she’s ever found. That it also comes with a reference to the building boom that resulted from the harvesting of the Coquimbo‘s cargo makes it an even rarer historical gem. 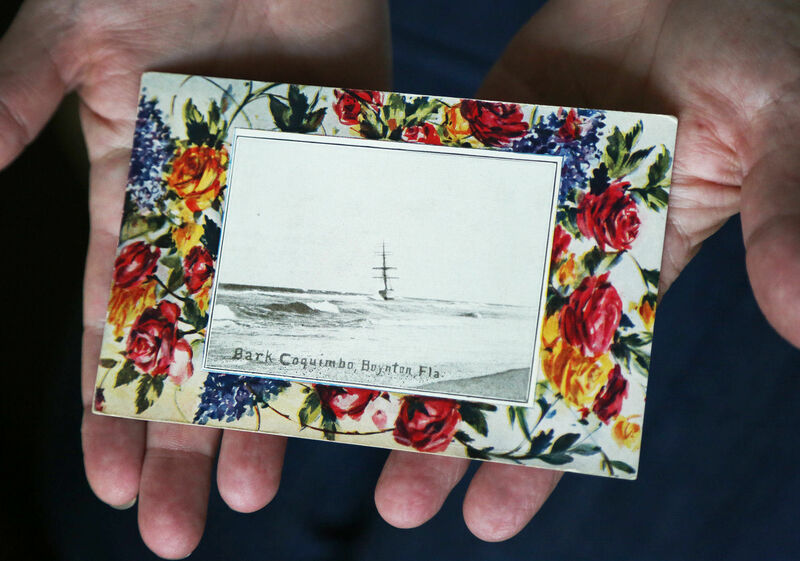 To flesh out the story behind the postcard, DeVries tried to identify the “Clyde” who had mailed it. From her decades of historical research into the area, she knew that there were only two Clydes in Boynton Beach at that time. One of them was a carpenter who had helped build the hotel, so she thought he was the likely candidate. The dates didn’t pan out, however, so she turned to the second Clyde. 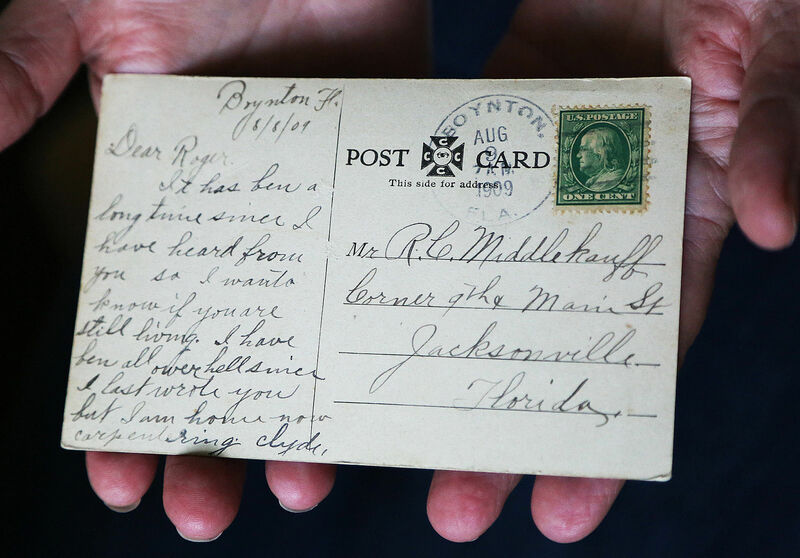 The recipient of the postcard was one Roger C. Middlekauff of Jacksonville, Florida. There’s no further information about him at this time. Keep an eye on the Boynton Beach Historical Society blog for more about Clyde Miller. The postcard will be added to the documentation of the wreck that DeVries has been compiling for years in order to have the site recognized by the state. What’s left of the Coquimbo was discovered in January of 2013 by free-diver Steve Dennison. His heart pounded when he saw it: The huge bow of a ghostly ship jutting from the sand as if rising from its watery grave. The hull that had looked black from the surface was reddish-brown close up, covered with marine organisms. He went down and grabbed the bow, and felt the cold metal underneath the barnacles. He then saw a metal mast, then another mast, and about 200 feet from the bow he could see the stern and the steering mechanism. The hull was still buried underneath the sand. It had been exposed by the storm surge of Hurricane Sandy. You can see a slideshow of the wreck here and I’m embedding video of it below. The ship was only visible for a brief three months. When Dennison returned in April it was completely covered in sand again. The excavation of the site of the former Bridges Garage in Cirencester has unearthed a wealth of Roman funerary material from 75 graves, including pottery, jewelry and an extremely great chicken. Now Cotswold Archaeology (CA) has made another rare find: a tombstone with an inscription naming the deceased that may be covering her grave. Roman gravestones are rare — less than 300 inscribed ones have been found in the UK, 10 in Cirencester — but this one is in very fine condition, with the pediment atop the stone unbroken and the inscription is still sharp and complete. 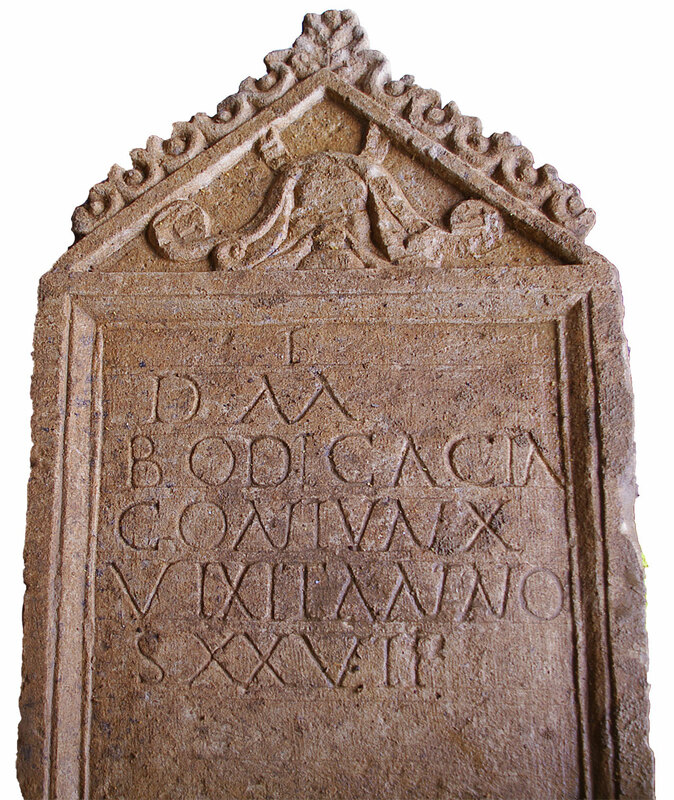 The inscription is five lines long and reads: “DM BODICACIA CONIUNX VIXIT ANNO S XXVII.” DM is an abbreviation for Dis Manibus, literally “to the spirits of the dead,” a frequently used dedication on tombstones, so the full inscription translates to “To the spirits of the dead, Bodicacia, wife, lived 27 years.” It only fills the top half of the stone and there are horizontal lines on the bottom half that suggest it would be filled in with another inscription at a later date, perhaps when the husband died, but then it never happened. The tomstone is made out of Cotswold limestone and is elaborately decorated and impeccably carved. Bodicacia’s husband must have been quite well off to be able to afford such an expensive piece. The Cotswold Archaeology team has been digging since January as a precursor to the construction of an addition to the St James Place Wealth Management structure that was built on the Bridges Garage site. They’ve discovered a total of 55 graves and were almost finished with the excavation when they found the tombstone. Cotswold Archaeology has a short timelapse video of the lifting of the headstone here, and since the BBC filmed the event and broadcast it live, its article has two videos, one of the lifting of the stone, and one interview with CA archaeologist Neil Holbrook after the stone was turned over to reveal the inscription. What makes this discovery all the more remarkable is that the tombstone survived at all. 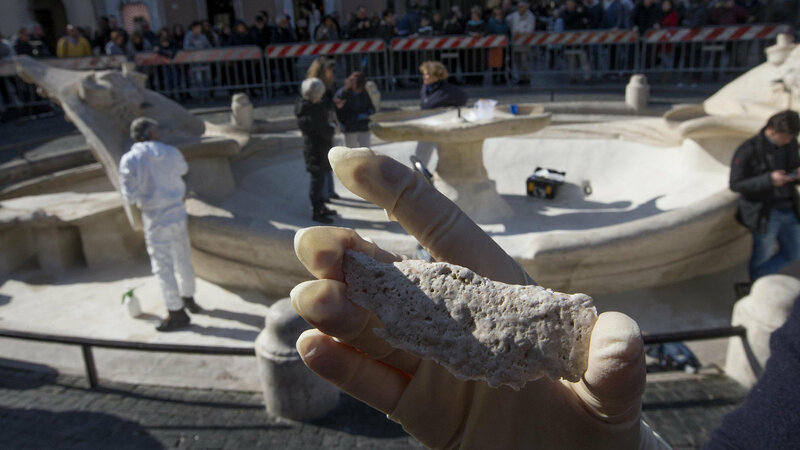 First it remained intact and virtually undamaged when it fell on top of the grave. Then it had to survive the stone foragers who looted graves and buildings to use as masonry for new construction. 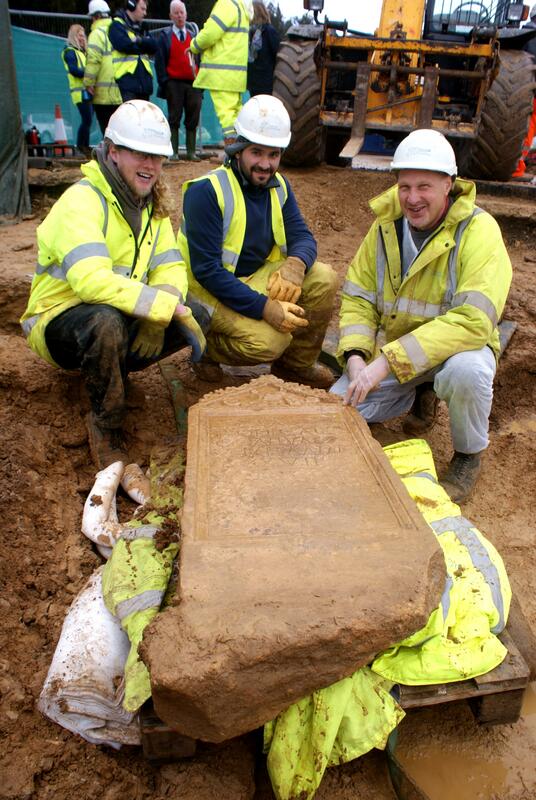 Archaeologists think that the headstone fell over relatively soon after it was installed and then was covered by soil so later looters missed it. Then it had to outwit modern development. Before the Bridges Garage was built in the 1960s, the site was excavated by archaeologist Richard Reece who found 52 burials and an engraved headstone (not connected to any human remains). Then a building was constructed and an area large and deep enough to accommodate two huge underground fuel tanks was dug up, so archaeologists didn’t expect to find much of anything intact when they surveyed the site in 2011 before new construction. 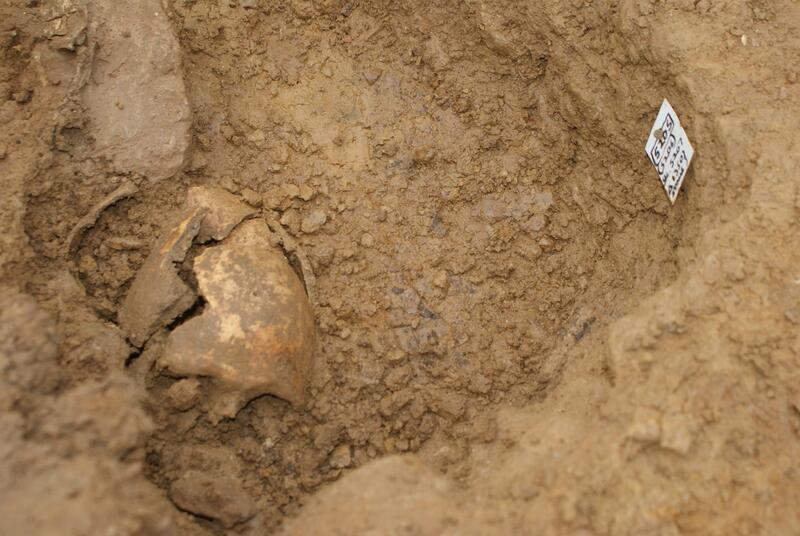 Instead they found an extensive burial ground with intact artifacts and human remains. 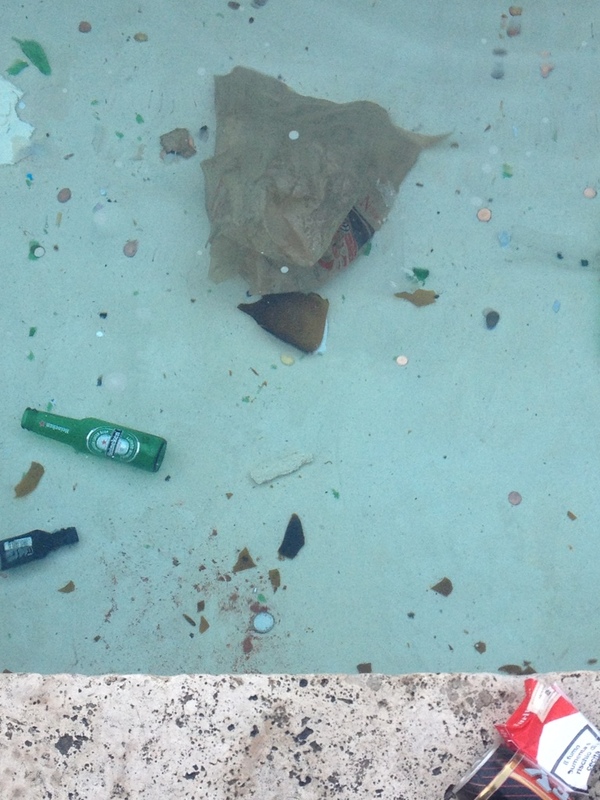 The tombstone and the fragile human remains just under it came within inches of destruction. The stone dates to 100-200 A.D. 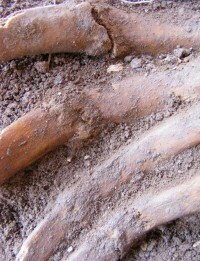 It was found on top of adult human remains and next to the remains of three very young children. This could very well be Bodicacia and her children buried in a family grave. 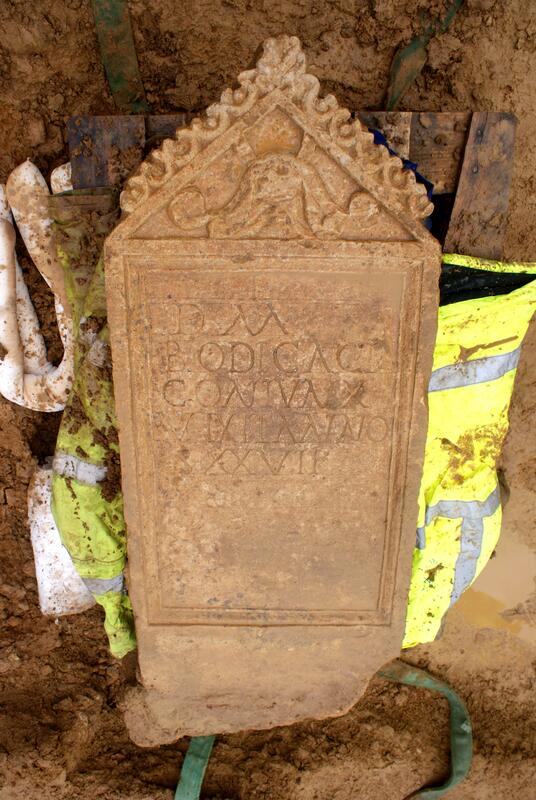 If it does prove to be Bodicacia’s grave, it will be the only of its kind ever found in Britain. Roman gravestones aren’t often found with associated remains; finding one with a name engraved on it which identifies the remains is the kind of thing you find in exceptional preservation conditions like Pompeii. Experts will study the tombstone and remains in depth, a process that could take two or so years, in the hopes of answering some of these questions. 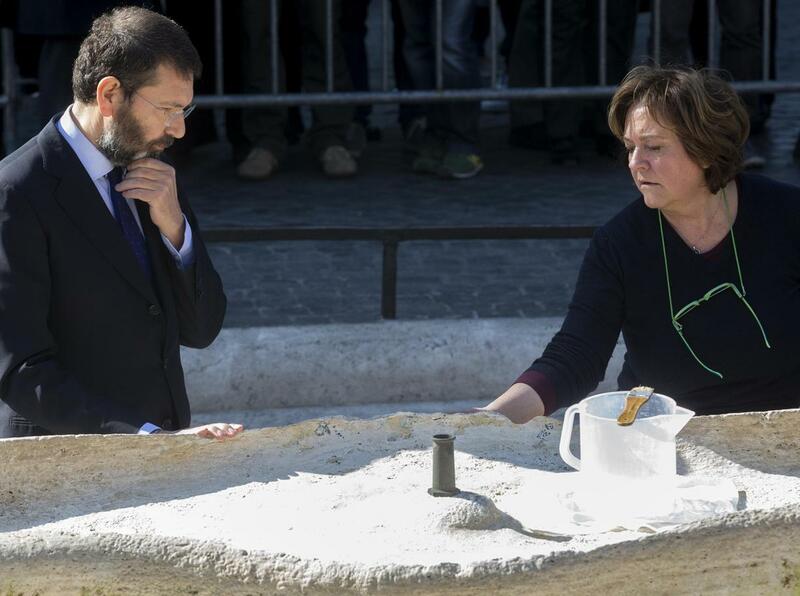 After that, the stone will be given a permanent home in a museum. The Corinium Museum has been the fortunate recipient of other treasures unearthed at the Bridges Garage excavations — the cockerel is on display there now — so they’re hoping they’ll get Bodicacia’s headstone as well. 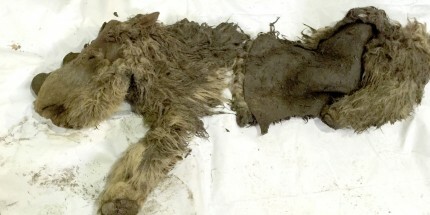 Two hunters have discovered the exceptionally well preserved remains of a baby woolly rhinoceros in the Abyysky district of Siberia’s Sakha Republic. 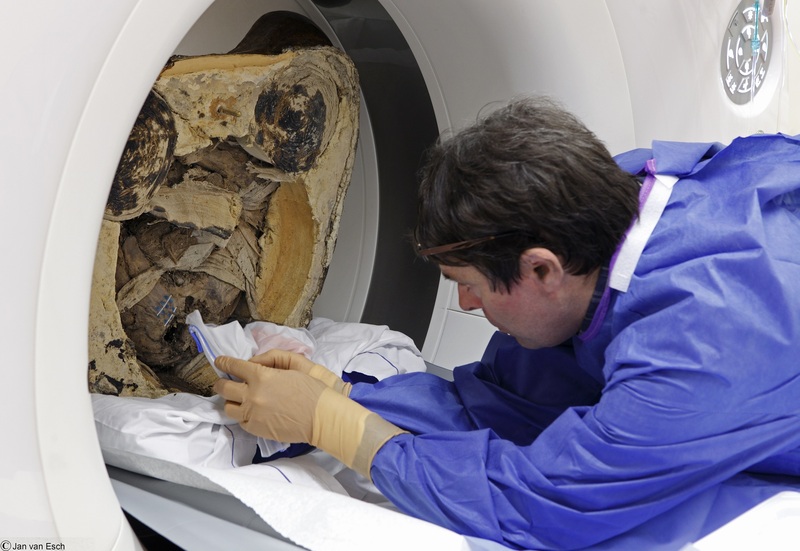 The Siberian permafrost is a rich source of pre-historic skeletal and fossil finds, but on rare occasions the deep freeze is found to have preserved the carcasses of fallen Pleistocene animals in such good condition that even soft tissues survive. While bison and mammoths have been found before (female mammoth, two baby mammoths, juvenile mammoth), this is only the second time a woolly rhinoceros has been found frozen rather than mummified or skeletonized, and it’s the first woolly rhinoceros calf that has ever been found in any condition beyond the occasional bone. The little fella was first spotted by hunters Alexander “Sasha” Banderov and Simeon Ivanov (the Siberian Times made a rather unfortunate error in translating Ivanov’s first name) when they were sailing on a stream flowing into the Semyulyakh River last summer. They saw some hair hanging from the top of a ravine on the right bank. At first they thought it was the remains of a reindeer, but they couldn’t confirm or deny because the carcass was far out of their reach. When they returned to the spot in September, the ice had thawed and the section of frozen earth containing the remains had thawed enough to break off and fall onto the river bank. Although a section of the carcass sticking out of the ice had been devoured by wild animals (there are visible teeth marks), the head was intact and its two horns immediately identified it as a rhinoceros. Banderov and Ivanov retrieved the rhino and carried it home to their village where they placed it in a glacier to keep it frozen. 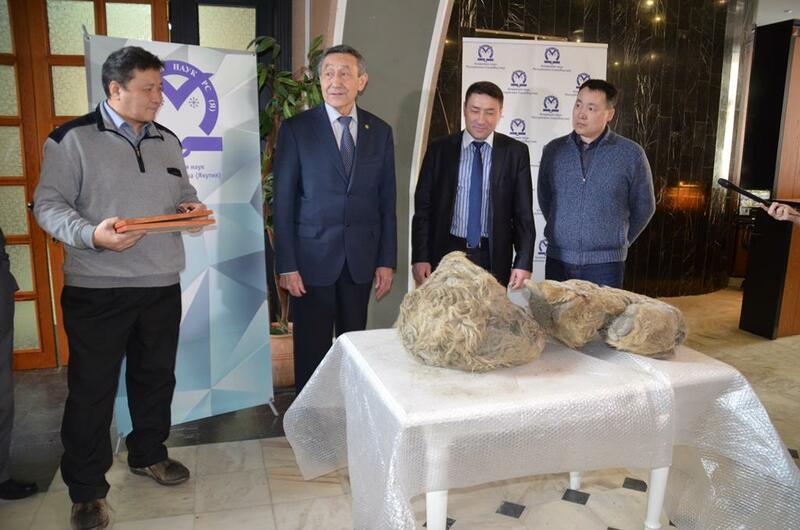 Knowing that scientists would want to examine this remarkable find, they contacted Albert Protopopov, head of the Mammoth Fauna Department of the Academy of Sciences of the Republic of Sakha, Yakutia. It took almost six months to get the carcass 1,800 miles away to Yakutia due to the challenges inherent in transporting anything across vast distances in the Siberian winter. Although it will take several months to get dating results, Sasha has to be at least 10,000 years old because that’s when the woolly rhinoceros became extinct. Scientists estimate the calf was about 18 months old at the time of death which was probably as a result of falling into a pit. 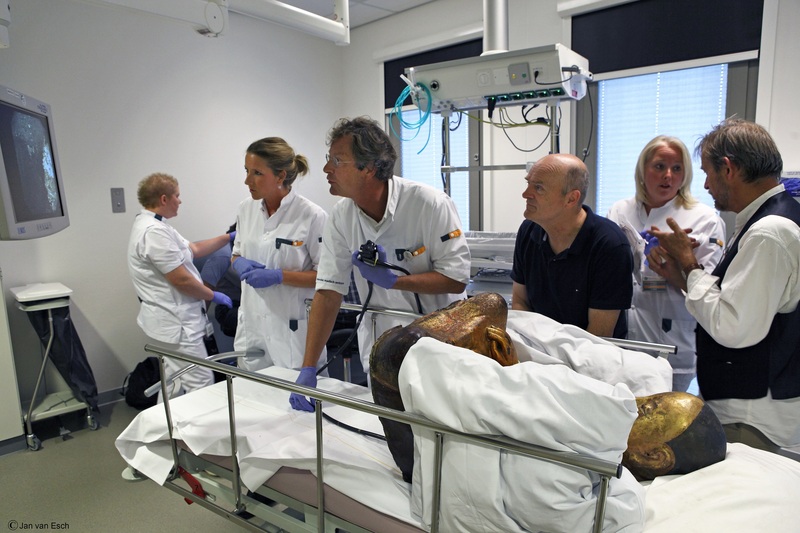 The team will focus first on extracting DNA from the carcass. Because the hunters were so brilliantly conscientious about keeping Sasha frozen, the odds of the scientists being able to extract testable DNA are better than usual. They hope they’ll be able to report on the first test results in a couple of weeks. In 2009, Hereford Cathedral began an extensive restoration of the cathedral close. 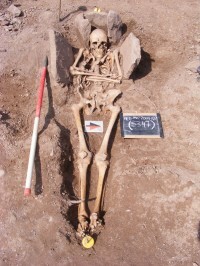 As part of the project, the area around the cathedral including a graveyard was excavated. 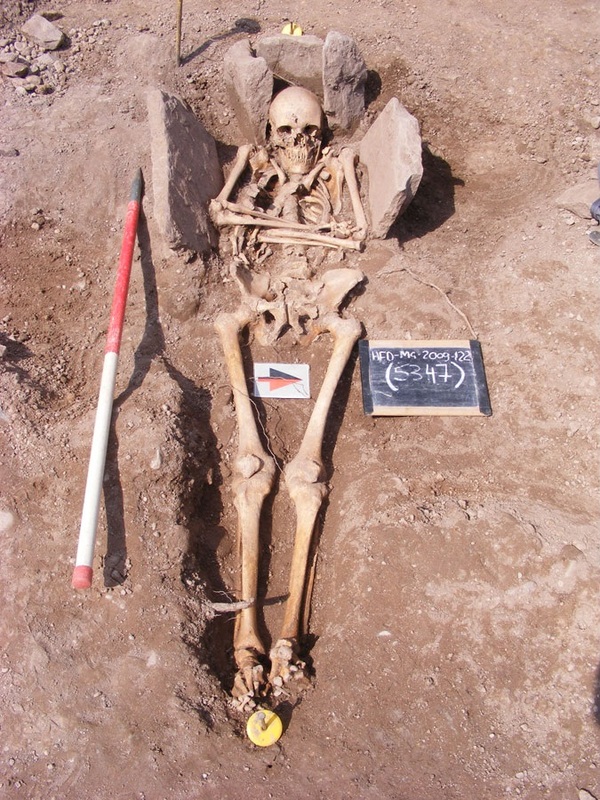 More than 700 skeletons dating from the Norman Conquest through the 19th century were unearthed between September of 2009 and May 2011, their bones providing a treasure trove of information about the lives and deaths of people from all walks of life over the course of nearly 1,000 years. 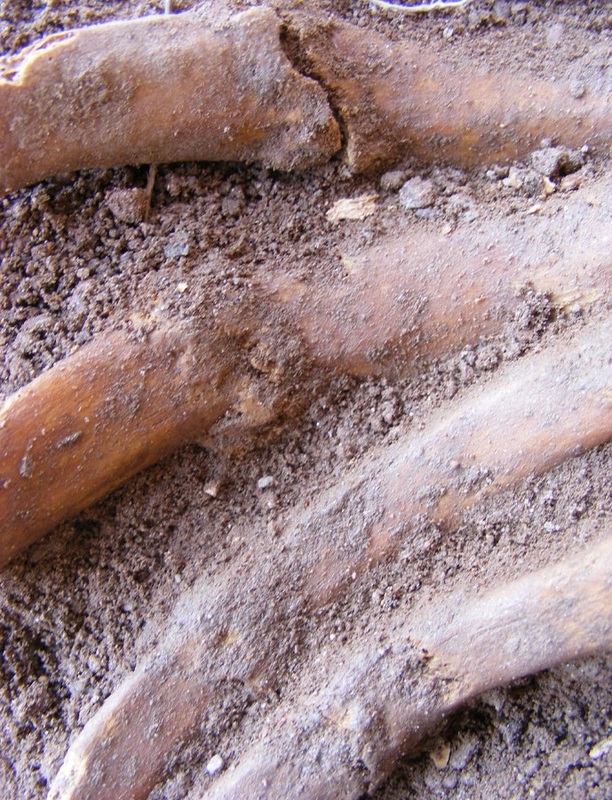 One of the skeletons may be a unique discovery: the remains of a man with wounds that strongly suggest he was fatally wounded in a joust. If that is indeed the case, this skeleton is the first of its kind that we know of ever unearthed in the United Kingdom. He was found buried in the churchyard very near the east end of the Cathedral, prime spiritual real estate due to its proximity to the high altar. The skeleton is of a well-built adult man 5’10” tall which puts him in the top 5% of men of his era in terms of height. 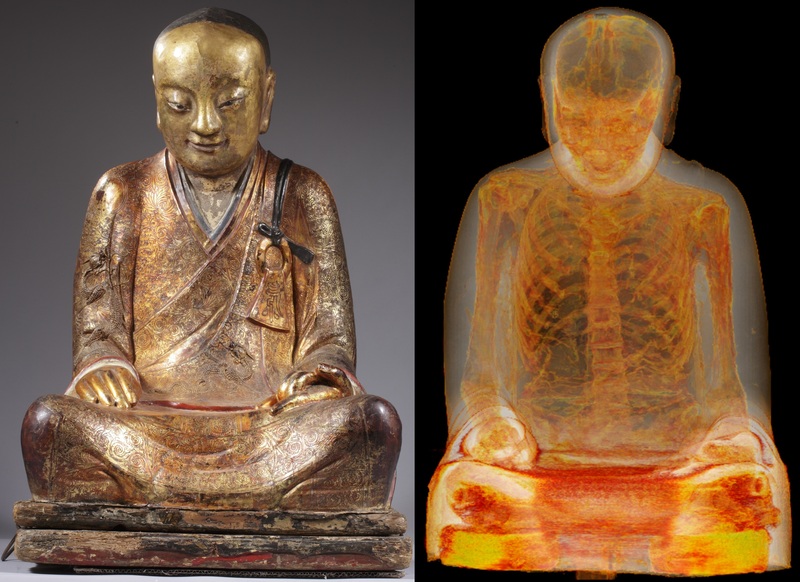 He was at least 45 years old when he died sometime in the late 12th, early 13th century. Stable isotope analysis of his teeth found he was raised in Normandy. 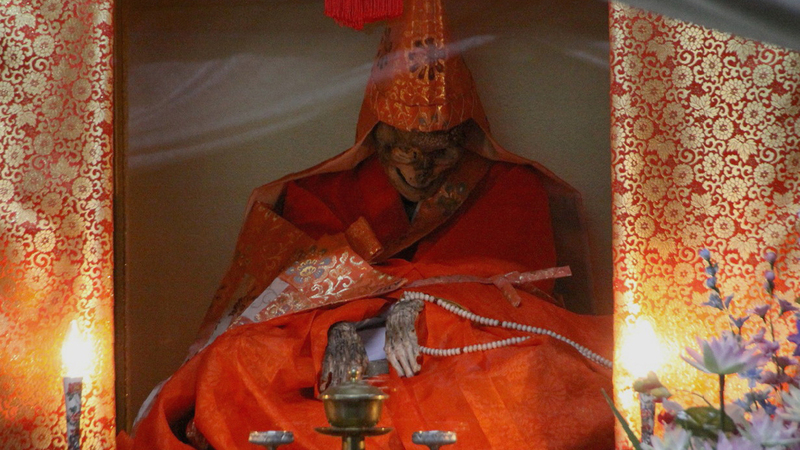 He was buried in a grave partially lined with stones, a sort of half-cist burial. His medical history is writ large on his bones. He had a badly fractured right shoulder blade which had fully healed by the time of his death and a serious break in the lower left leg that had also healed. It’s a twisting fracture, possibly the consequence of a blow to the right side of the body (maybe that shoulder hit?) while on horseback. The twisting may have happened when, in reaction to that blow, the body spun around violently while the left foot remained caught in the stirrup. Recovery from such serious breaks doubtless took a long time. It suggests that he fought in tourneys for years before his eventual death. There is no fatal blow that osteologists could find, but there are injuries potentially connected to one. He sustained at least nine rib fractures on two different occasions. The second occasion was the bad one as the rib fracture only shows signs of several weeks worth of healing. The blow to the ribs wasn’t fatal per se, but it was delivered along with the injuries that shortly thereafter claimed his life. Why couldn’t these wounds have been inflicted during actual combat, you ask? Good question. They could have been, but there are no blade or arrow injuries to the bone. No sharp-force trauma of any kind is extant, although of course he could have been stabbed, speared, shot a million times in his soft tissues without that showing up on the bones. If he did die as a result of tourney combat technically he was not allowed church burial. 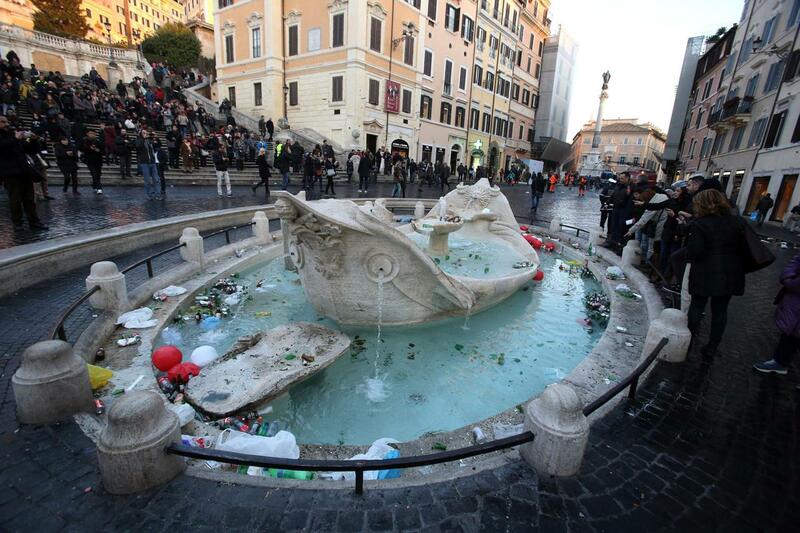 Jousts and its participants had been sternly condemned in the Second Lateran Council of 1139. We entirely forbid, moreover, those abominable jousts and tournaments in which knights come together by agreement and rashly engage in showing off their physical prowess and daring, and which often result in human deaths and danger to souls. If any of them dies on these occasions, although penance and viaticum [communion] are not to be denied him when he requests them, he is to be deprived of a church burial. 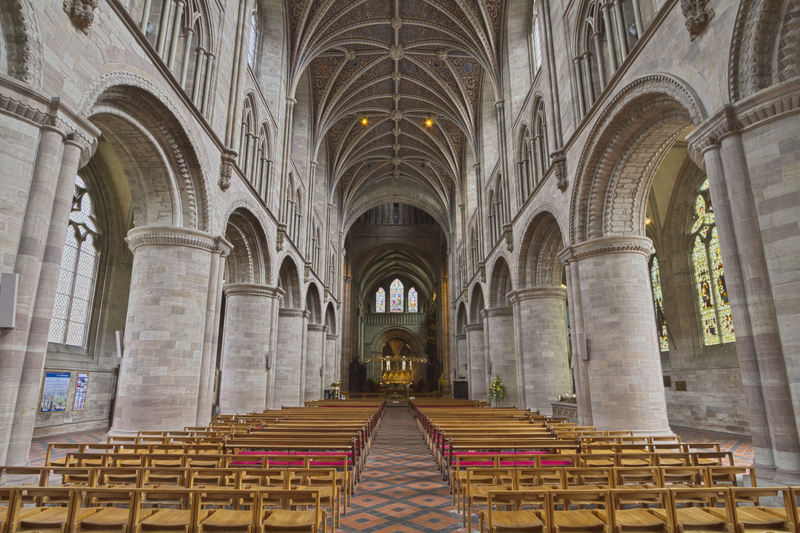 Perhaps burial just outside the physical structure of the church was the loophole used to see that the Hereford knight got a proper Christian burial in a location near the high altar as would suit a man of status despite his death from abominable jousting. Anyway it’s always easier to ask forgiveness after the transgression than permission before so the church’s prohibition had little effect in practice. 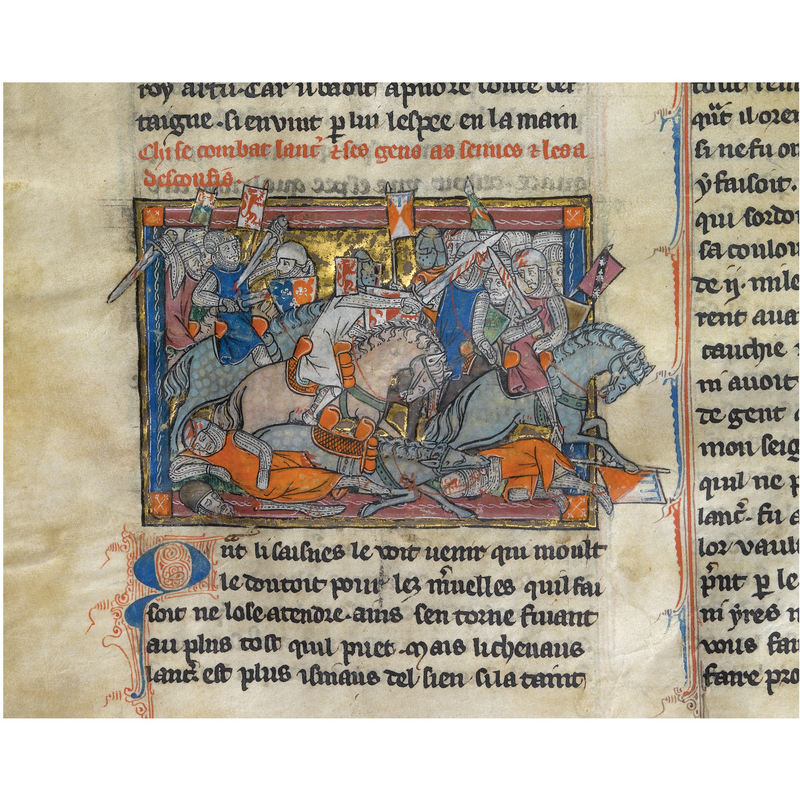 The Normans had introduced tourneys to England after the Conquest as bona fide war games. The use of heavy cavalry armed with lances to charge in formation developed in the second half of the 11th century, and those formation charges required a great deal of practice to work in a combat situation. 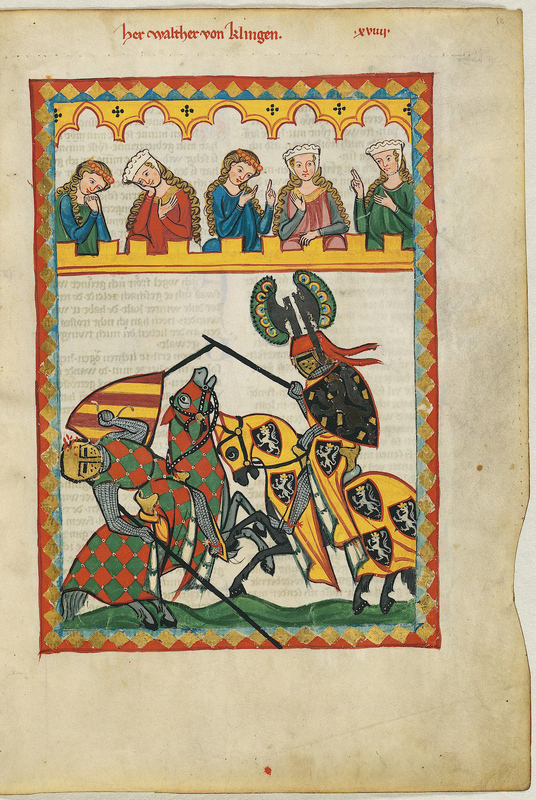 These early tourneys were mock battles, not one horseback lancer against another Ivanhoe-style, staged on large fields and fought by dozens, sometimes hundreds, of men at arms. They were dangerous, sometimes fatal, and inflicted more injuries on knights than actual battlefield combat did. There were prizes to be won, however — ransom money, weapons, armour, horses — and there was always a steady supply of younger sons of nobility with skill at arms but no prospect of inheritance willing to fight their way to wealth and status. Richard the Lionheart attempted to regulate tourneys by issuing a charter on August 22nd, 1194, authorizing them in only five locations and requiring participants to pay hefty fees according to their titles (an earl had to pay 20 marks of silver, a baron 10, a landed knight four marks, a landless knight two) before receiving a license to fight in the tournament. This served the king’s purpose in several ways. It dangled the prospect of profit to the knights, keeping them in the country and available to defend the realm while at the same time keeping them from constantly injuring each other in tourney after tourney. It also made the assembly of large numbers of heavy cavalry subject to monarchical approval, a mechanism that would only grow in importance after Richard’s death and the subsequent clashes between crown and barons that famously resulted in Magna Carta. Last but certainly not least, it put significant coin in the king’s pocket. The charter could not quench the thirst for tournaments which were still held outside of the crown’s rules. One famous joust was held at Chepstow Castle on the Welsh side of the border 35 miles south of Hereford in 1227. The castle (called Striguil Castle by the Normans) had been home to William Marshal, dubbed “the greatest knight that ever lived” by Stephen Langton, Archbishop of Canterbury, in his eulogy for William after his death in 1219. His son, also named William, succeeded his father as Earl of Pembroke and Lord Marshal of England to King Henry III. It was the younger William who hosted the 1227 tourney without permission from the king. Knights attached to eight earls, including the Earl of Hereford, fought in the tournament, and at least one of them, Reimund de Burgh, relative of Hubert de Burgh, Henry’s regent during his minority who the king had just that year made the 1st Earl of Kent, was heavily fined for his participation. Thus the king profited financially even from the illicit tourneys. Given its proximity to Hereford and the date range of the cathedral’s knight, it’s conceivable that he could have fought in that very tournament. It could even have been the one to fell him, for that matter. I doubt we’ll ever know. 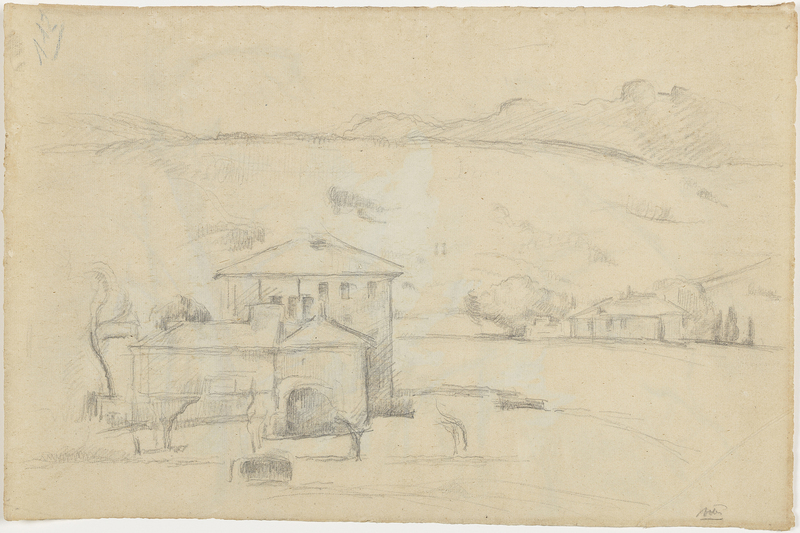 Unfinished sketches have been discovered on the back of watercolors by Paul Cézanne in the collection of the Barnes Foundation in Philadelphia. The watercolors, previously on display in room 20 of the Collection Gallery, had been out of their frames before, but the backs were hidden behind brown paper. It was that brown paper backing, ironically, that spurred the discovery of what it had been hiding for a century a so. Brown paper is highly acidic. Over time the acid migrates from the backing into the original paper medium causing it to darken and become brittle. 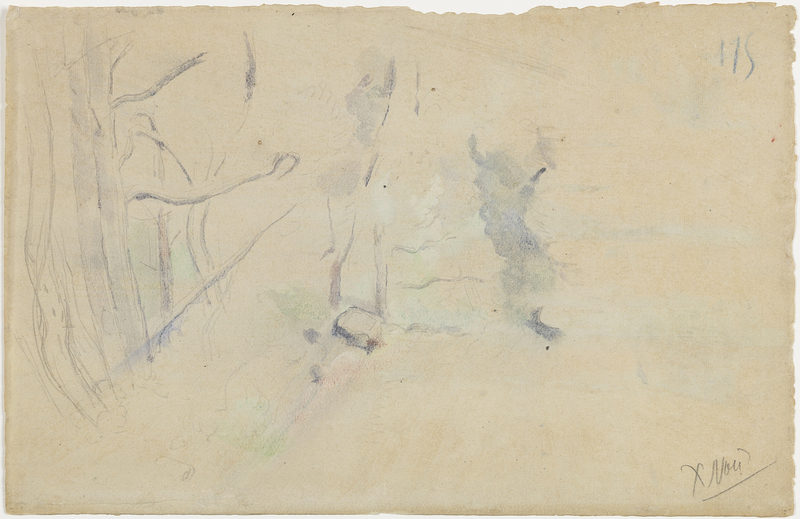 The Barnes Foundation knew that five Cézanne watercolor landscapes needed to have the brown paper backing removed and in January of 2014, all five of them were sent as part of a group of 22 works to the Conservation Center for Art & Historic Artifacts (CCAHA), also in Philadelphia, for treatment. Photographs © 2015 The Barnes Foundation. CCAHA paper conservator Gwenanne Edwards was painstakingly removing the backing from the 1885-1886 watercolor entitled The Chaîne de l’Etoile Mountains with a microspatula when she saw swirls of blue and green and some pencil lines. Once the backing was entirely removed, an unfinished sketch of trees done in pencil and then accented with watercolors was revealed. It’s hard to determine exactly what the subject is since the sketch is so incomplete, possibly a path winding through trees with a square well in the center. The bottom right corner has a pencil note on it, an “X” and the word “Non” with what appears to be a question mark after it. This is not the work of the artist; it’s probably a notation from a dealer on whether its saleable. Behind the backing of the second watercolor, Trees, conservators found a much more detailed graphite-only sketch of a manor house and farmhouse with a mountain in the background. 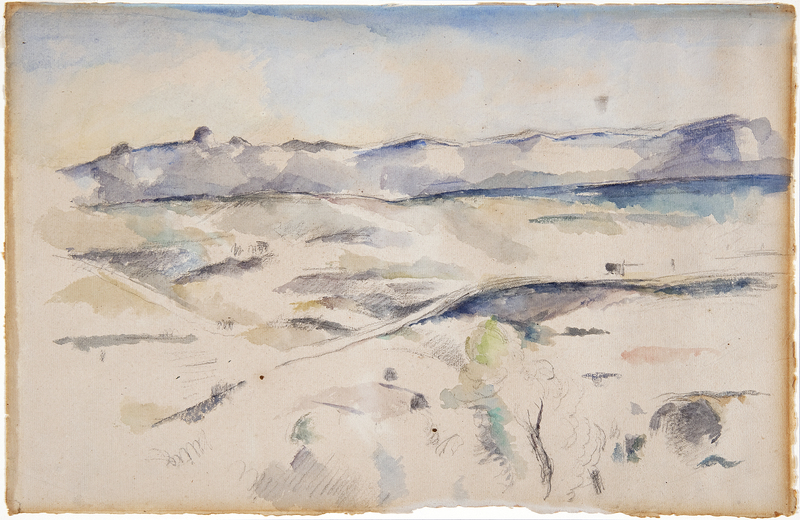 Denis Coutagne, president of the Société Paul Cezanne in Provence, researched the drawing and identified the location as the Pilon du Roi peak in the same Massif de l’Etoile mountain range in Aix-en-Provence, southern France, depicted in the first watercolor. This was one of Cézanne’s favorite locations which he painted and drew many times over. 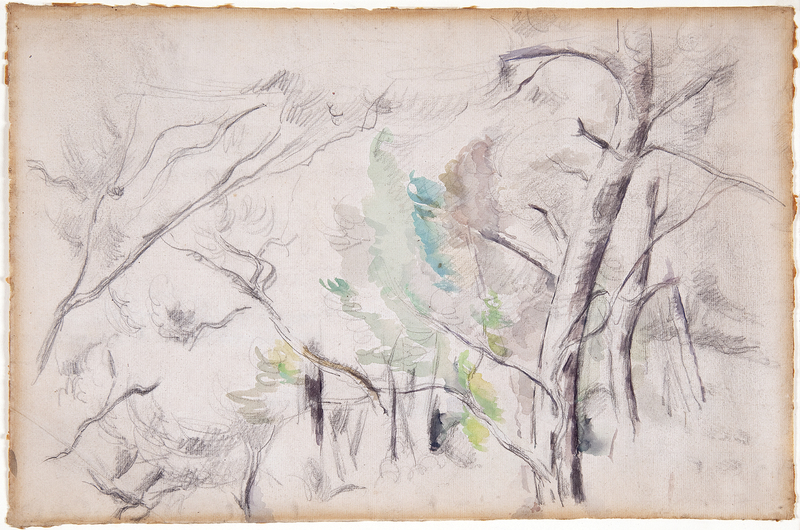 It was not uncommon for Cézanne to work on both sides of the paper in his sketchbooks and on larger, individual sheets such as these, and over the course of his career he produced thousands of drawings, some of which were done in preparation for oil paintings, but most often they were a place to experiment with line and color. “These sketches offer a window into Cezanne’s artistic process, which is truly invaluable,” said Barbara Buckley, Senior Director of Conservation and Chief Conservator of Paintings at the Barnes Foundation. The five brown paper-backed watercolors were acquired by millionaire chemist and eccentric art collector Albert Barnes in 1921. 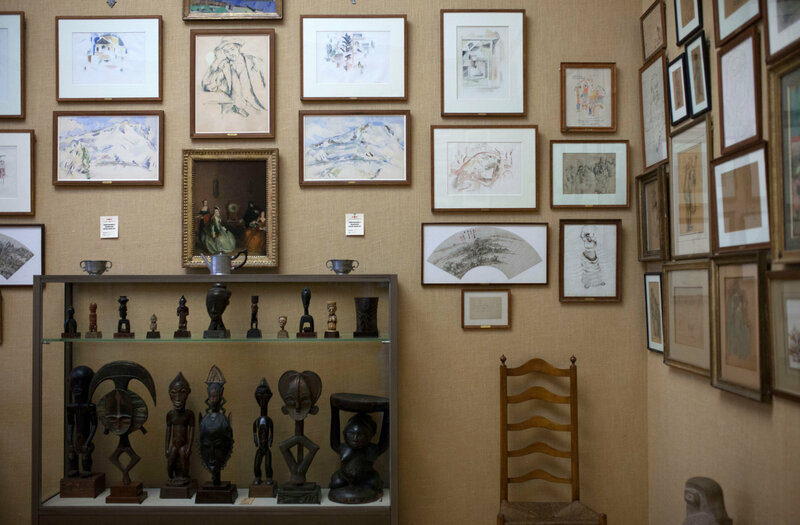 The seller was Leo Stein, author Gertrude Stein‘s brother, who between 1904 and 1914 had built with his sister an exceptional collection of modernist works in their shared apartment at 27 rue de Fleurus in Paris. Leo Stein was a particular devotee of Cézanne, so much so that when they dissolved their household and split up the collection in 1914, Leo let Gertrude have all the Picassos and most of the Matisses but insisted on keeping Cézanne’s small 4 3⁄4 by 10-inch oil painting Five Apples (now in the collection of Mr. and Mrs. Eugene V. Thaw). Leo Stein and Albert Barnes had been friends for years at the time of the sale, bonded by their shared love of art. When financial difficulties forced Stein to sell some of his collection, he asked Barnes to arrange the sale of some pieces in the United States. Barnes wrote to Stein that he had been unable to find buyers for the five watercolor landscapes because nobody he had contacted “seems to think they are sufficiently important to want to own them.” We can’t be sure whether that was in fact the case or if Barnes was being economical with the truth in order to score a bargain, but the final result was Barnes acquiring all five for $100 each. There is no evidence in the correspondence that either Stein or Barnes had any idea there were sketches on the back of two of them. Given the probable dealer pencil markings on one of the sketches, it’s likely that the backs of the watercolors had already been covered with paper before Stein bought them. The newly discovered sketches will be on display in double-sided frames in the second floor classroom of the Barnes Foundation from April 10th through May 18th, after which they will return to their former one-sided display in Room 20. This is an extremely rare opportunity to see anything at all from the Barnes collection not in its assigned location. Barnes left very strict, very specific instructions on the management of the art in Foundation’s charter. 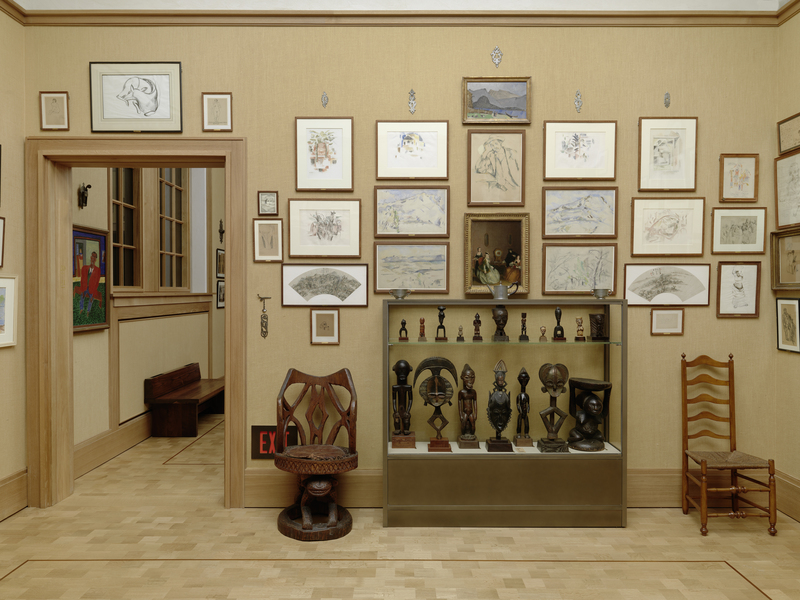 One of the rules is all the works have to be displayed exactly where Barnes chose to display them, never moved, never removed, never sold, never loaned. Even taking down works for conservation purposes requires the permission of the Pennsylvania Attorney General. Barnes arranged his art the way he liked it, a configuration he felt most in keeping with his Deweyite educational principles. 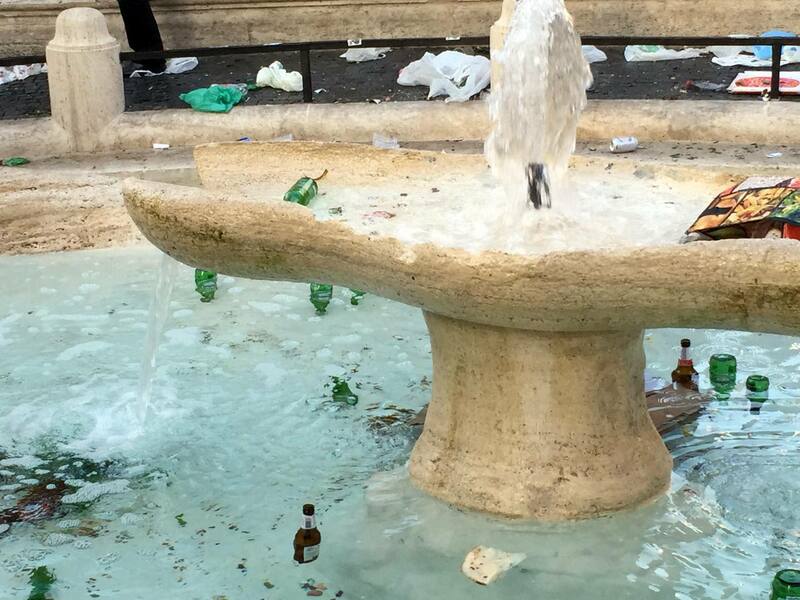 The Foundation was to be an educational institution for students of art, not a museum for the general public. Those rules have since been challenged by the foundation’s board, most notably in the controversial decision to break Albert Barnes’ will and move the entire collection from Barnes’ home in Merion, five miles outside of Philadelphia, to a new, larger facility on the Benjamin Franklin Parkway in metro Philly. The excellent but agonizing 2009 documentary The Art of the Steal (available on Netflix streaming or for rent on Amazon Instant) covered the shenanigans involved. 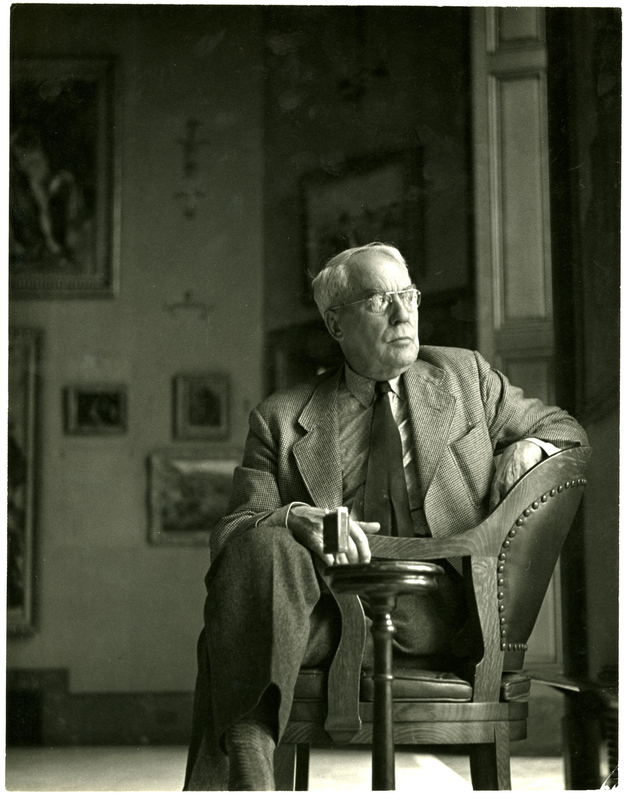 You can read the Barnes Foundation’s rebuttal to the documentary here. Archaeologists excavating near the village of Skomack Wielki in northeastern Poland have unearthed numerous bronze, iron and pottery artifacts from a settlement dating to the 5th or 6th century A.D. Artifacts from this period in this area are rare, and most of the ones that have been found were discovered in cemeteries. 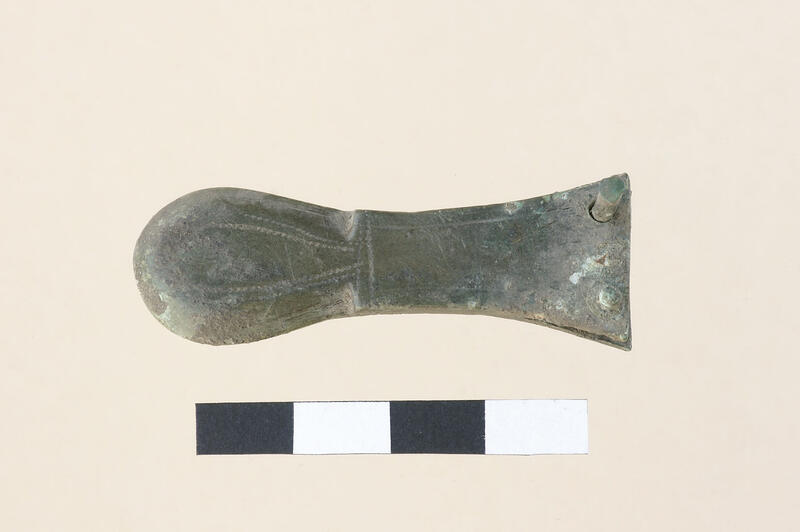 Among the most valuable finds are ornaments, brooches and buckles made of bronze, as well as toiletries (tongs) and knives. 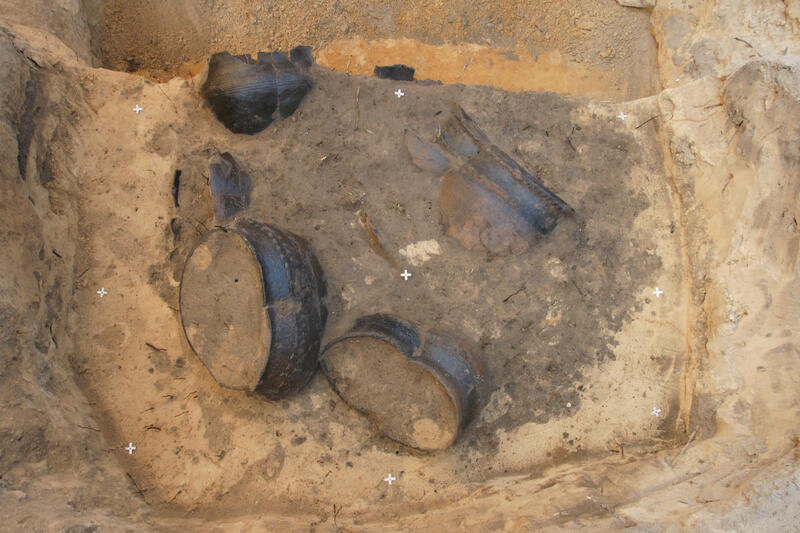 In one place, archaeologists discovered cluster of entirely preserved 7 ceramic vessels. They differ in size, finish (some carefully smoothed, some rugged), decoration in the form of plastic strips, ornaments made with fingers or engraved. “The whole deposit gives the impression of a specially selected set, although at this stage of research it is difficult to say what was the purpose of selection and of the pit, in which the vessels had been placed” – commented Dr. [Anna] Bitner-Wróblewska. Although the population of the area in late antiquity and the early Middle Ages is generally associated with the Sudovian/Yotvingian tribe, archaeologists believe the community in this settlement was a West Baltic tribe called the Galindians who had established connections with peoples to the north, south, west and east of them going back as far as the 2nd century A.D. when Greco-Egyptian astronomer, mathematician, poet and geographer Claudius Ptolemy mentioned them in his Geographia. The range of the ancient tribe was whittled down to a central core in the wake of the upheavals of the late Imperial period. By the 6th/7th century Ptolemy’s Galindians survived as the Old Prussian clan of the Galindis. 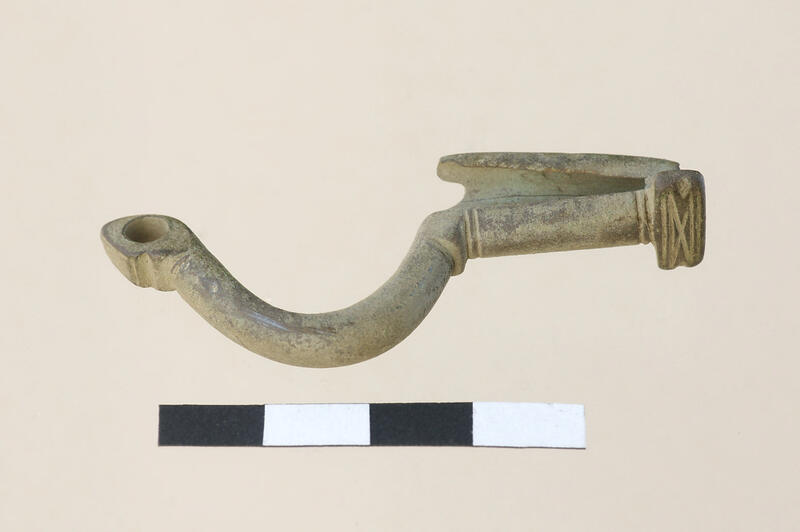 These artifacts, therefore, are from a significant transitional period in the history of the region. The pottery vessels, still filled with soil, have been removed to the National Archeological Museum in Warsaw where the contents will be examined under laboratory conditions. The museum is a partner in the Polish-Norwegian Modern Archaeological Conservation Initiative “Archaeology of the Yatvings” which seeks to explore the mutli-period settlements of Baltic tribes (the Yatvings of the title) in the early medieval centers of Szurpiły and Skomack Wielki in Poland’s Warmińsko-Mazurskie region. 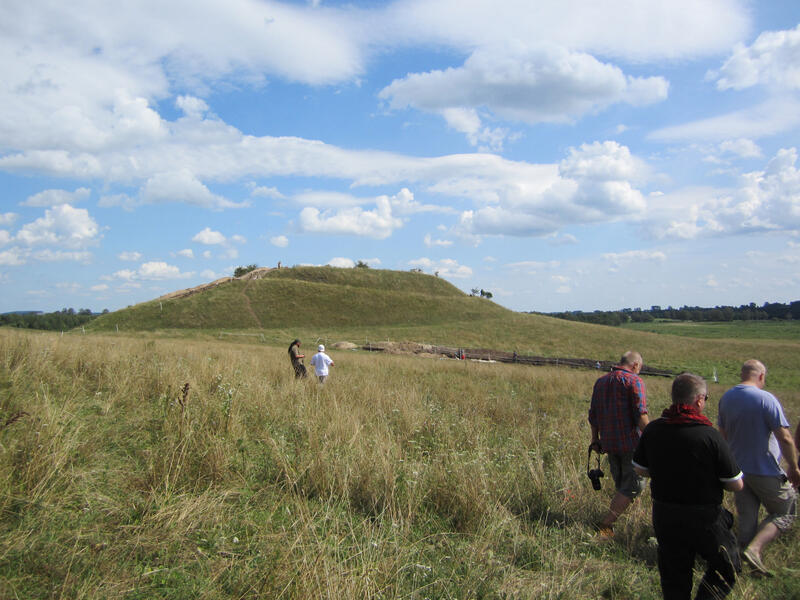 This is the first archaeological initiative in Poland to prioritize non-invasive methods of investigation like aerial exploration and geophysical surveys to locate and identify archaeological remains and determine how well preserved they are. The project began last year with non-invasive analysis of the sites followed by targeted excavations. It is scheduled to continue through 2016. The ultimate objective, in addition to learning more about the little-known settlement structures of ancient and early medieval Yatvings, is to develop a usable model of heritage protection coupled with archaeology that will give local communities a fuller understanding of their rich history and a preservation-based approach to cultural tourism. Germany giveth and Germany taketh away. Last month the Toledo Museum of Art (TMA) announced it had acquired Napoleon’s brother’s exquisite spiral chandelier from a Hamburg art dealer. 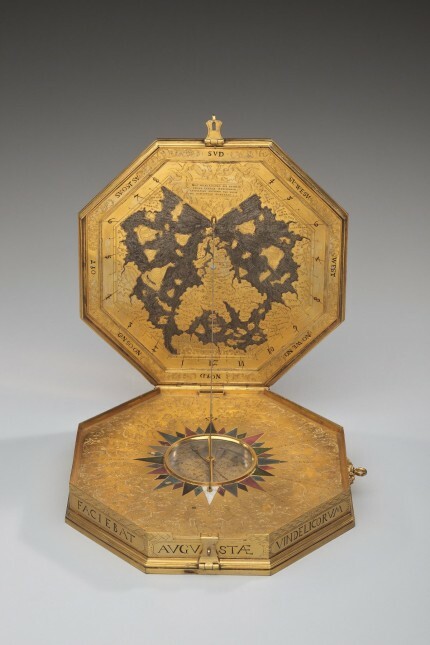 Two days ago the museum announced it would voluntarily return an exquisite 16th century astronomical instrument to the Gotha Museum in Germany after being presented with evidence that the object had been stolen from the museum after World War II. The instrument is a multi-use device known as an astrological compendium made by Augsburg craftsman Christopher Schissler in 1567. Schissler was considered the greatest of Augsburg’s instrument makers, crafting pieces of the highest quality from precious materials for the likes of August I, the Elector of Saxony, and Rudolf II, Holy Roman Emperor. Only around 100 instruments made by Christopher Schissler are known to have survived. This particular one was made for the Kunstkammer of Rudolf’s court in Prague. Rudolf was fascinated by mechanical devices and gave Schissler, along with other top instrument makers, access to court astronomers so they could be apprised of the latest research. He supported them financially and encouraged them to develop new designs and mechanisms. This device is very much a show-off piece, a showcase for its owner’s wealth and scientific knowledge. Made from gilded bronze and enamel, it’s an astrolabe, but it also has a variety of other functions. The outside cover is a sun dial, the inside cover a map of the world from which a plumb-bob can be hung to calculate angle of inclination. Interior compartments include a wind rose, a compass, a lunary (a device to calculate the time based on the moon), a perpetual calendar and a zodiac showing which signs govern which days. It is inscribed along its octagonal edges “CHRISTOPHORUS SCHISSLER FACIEBAT AUGUSTAE VINDELICORUM – ANNO DOMINI 1567” (Christopher Schissler made this, Augsburg ― Anno Domini 1567). Image courtesy the Toledo Museum of Art. 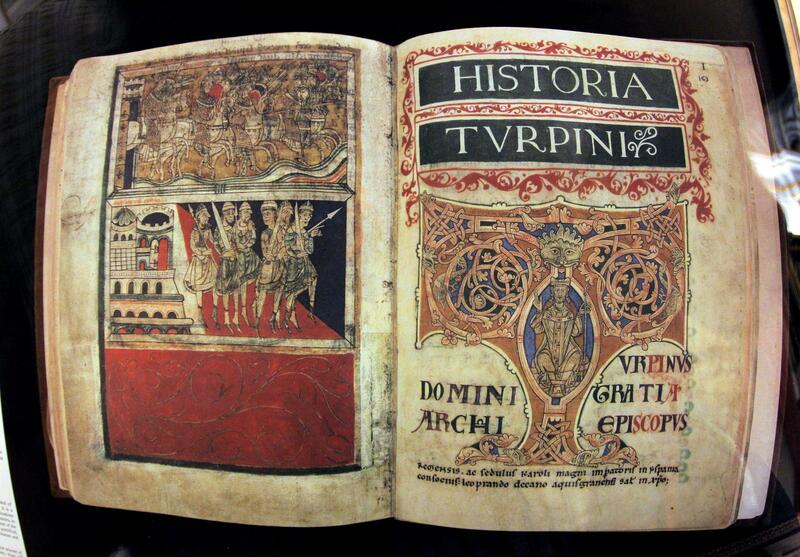 The Schissler Compendium remained in Prague Castle until 1620 when it was taken as plunder by the forces of Maximilian I, Elector of Bavaria, after their victory against Frederick I, King of Bohemia, at the Battle of the White Mountain, one of the early clashes of the Thirty Years’ War. It was taken to Munich. Twelve years later, it was plundered again, this time by King Gustavus Adolphus of Sweden who invaded Bavaria and in May of 1632, took Munich. Gustavus Adolphus died in battle later that year and after his ally Bernhard of Saxon-Weimar died in 1639, the spoils from Bavaria were divided among the survivors. The Schissler Compendium went to Bernhard’s brother Ernest I, Duke of Saxe-Gotha, who installed it in his collection at Gotha. Inventory records from the 19th century indicate the instrument stayed put in the collection of the Dukes of Gotha at Friedenstein Castle for 300 years. When the palace was converted to a museum, the compendium went on display alongside a larger astrolabe by Schissler. Much of the collection was moved during World War II for safekeeping and returned after the war was over. Thuringia was occupied by American forces for a few months after the end of the war, and then the Soviets took over. They took many of the Gotha Museum treasures to the Soviet Union only to return them after the establishment of the German Democratic Republic (East Germany) in 1949. We know that the Schissler Compendium was not among the art and artifacts returned to the museum by the Soviets. So somewhere in the chaos of wars world and cold, the instrument made its way to New York art dealers and thence to Toledo, Ohio. The Toledo Museum of Art had no knowledge of its checkered past until May of 2013 when Dr. Martin Eberle, director of the Gotha Museum, wrote them a letter about the astrolabe. He included considerable documentary and photographic evidence that Toledo’s Schissler Compendium and the Gotha Museum’s Schissler Compendium were the same piece. After a couple of months spent reviewing the documentation, TMA Director Dr. Brian Kennedy wrote back to Dr. Eberle acknowledging that it seemed their astrolabe was the one stolen from the German museum. The institutions negotiated for a year after that, planning the repatriation of the object and the loan of artifacts from the Gotha collection to the Toledo Museum of Art in exchange. 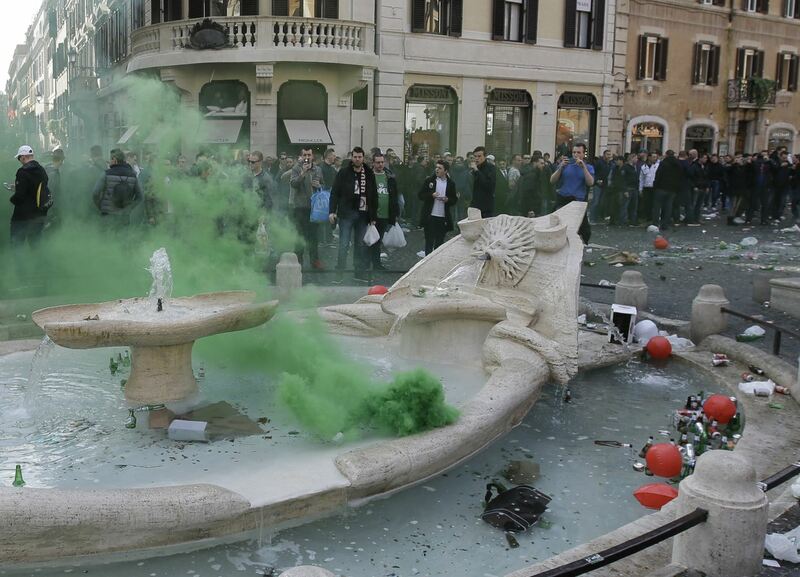 They still haven’t decided which pieces will be loaned, but they’ll sort that out in due course. Meanwhile, repatriation is nigh, tentatively scheduled for March or April of this year. Kudos to the TMA for returning the piece. There’s no legal requirement that they do so. The UNESCO Convention on the Means of Prohibiting and Preventing the Illicit Import, Export and Transfer of Ownership of Cultural Property does not apply, nor do the protocols regarding Nazi loot. This was entirely an ethical choice they made because they think it’s the right thing to do. [U]nlike earlier cases, this is one that involves no government bureaucracy or complications raised by potential thieves or distributors awaiting trial. It is, as Mr. Kennedy noted, simply an agreement between two museums to get a historically valuable piece back to its rightful owner. He said the TMA had made it museum policy over the past 10 years to look harder into the ownership history of every piece. 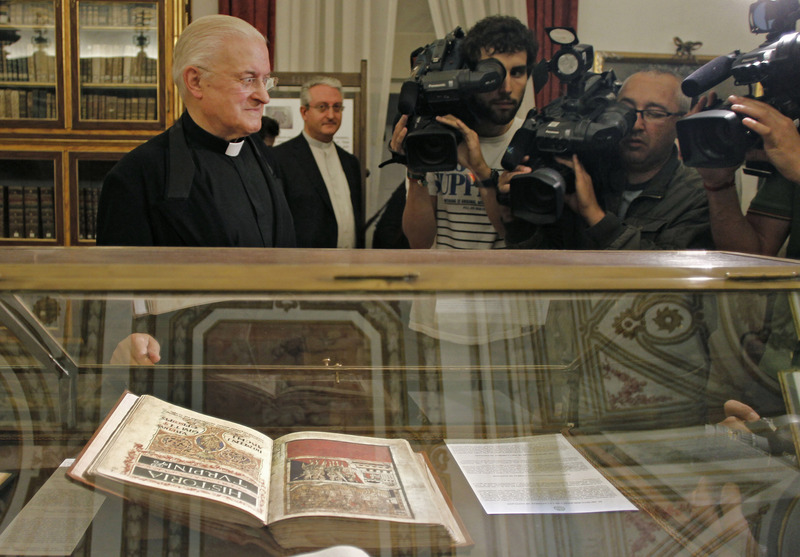 On Wednesday the Provincial Court of La Coruña convicted former electrician José Manuel Fernández Castiñeiras of stealing the Codex Calixtinus, an invaluable 12th century manuscript that contains the first travel guide for pilgrims on their way to the shrine of St. James in the Cathedral of Santiago de Compostela. For the theft of the codex, ongoing burglaries of cash and other items and money laundering, Castiñeiras was sentenced to 10 years in prison (three for the codex, five for the burglaries, two for the laundering) and a 268,000 euro ($304,000) fine. His wife Remedios Nieto was sentenced to six months for money laundering and got her own 268,000 euro fine because she had to have known her husband’s wealth was ill-gotten. 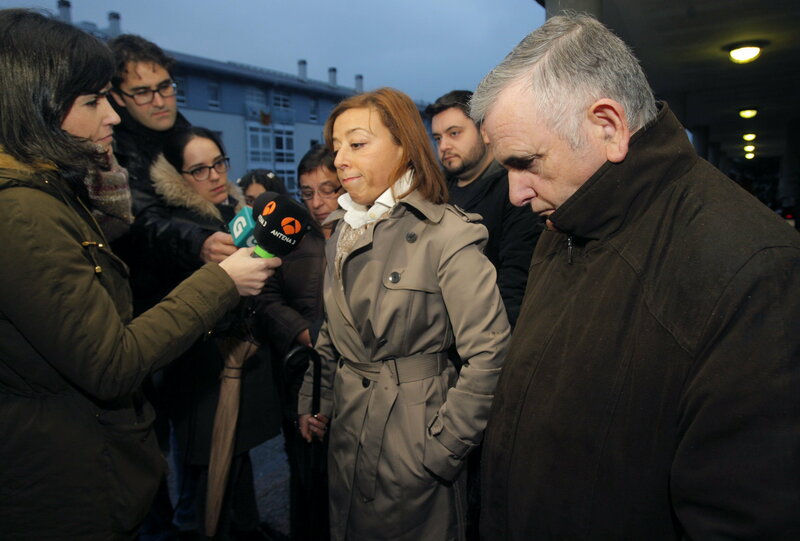 His son Jesus Fernández Nieto was acquitted as the court considered him a patsy used by his father who bought two apartments in his son’s name to launder some of the stolen money. The court concluded that the electrician had taken keys to, among other locations, the office of the Dean and of the administrator, and used them to gain access to the Cathedral safe that regularly held large quantities of cash from sales of tickets to the Cathedral museum and roof, rent from Church properties and donations of the faithful. The total amount Castiñeiras stole in cash alone is 2.4 million euros ($2,735,000) in currency from 59 countries. Defense counsel Carmen Ventoso tried the “this whole courtroom is out of order” defense, calling the trial a “procedural Guantanamo” in which the defendants’ rights had been trampled from before they were even on trial. She claimed police had broken into the house and installed monitoring devices a month before the arrest, that the official police search exceeded the parameters of the warrant, that the first interview in which Castiñeiras admitted he had stolen the Codex at 12:00 AM on July 4th, 2011, was full of errors and invalidated by the interrogator’s hardball tactics (“suggestive,” “argumentative” and “repetitive” questioning verging on duress), and that the Cathedral’s security camera footage showing the defendant shoving stacks o’ cash into his pockets was altered after the fact to incriminate her client. She wanted the search thrown out and all the evidence gathered as a result of it. The court, unsurprisingly, was not persuaded by this argument or by Ventoso’s repeated imprecations against Judge José Antonio Vázquez Taín who, according to her, is a sterling example of “what shouldn’t be done.” The judge didn’t buy her next defense — that Castiñeiras had OCD and was a hoarder — either, on account of he somehow managed to overcome this compulsion just fine when he invested his filthy lucre in property. On the stand last month, the first time he spoke publically about the theft, Castiñeiras admitted he had “probably” stolen all that cash (different news stories put the amount at anywhere from 1.7 to 2.4 million euros) from the Cathedral safe before he had a stroke in 2004, but he stopped keeping his accounts after the stroke and couldn’t remember if he kept stealing. When the magistrate asked him if he had stolen any other artworks or valuables from the church (a number of antiquities were also found in his home), the defendant replied that he woke up every day at 6:00 AM to work hard for the Cathedral. Because apparently early mornings and work entitle you to stuff millions in cash, art, church documents and whatever else into your pockets, seems to be the implication. That fits with the disgruntled employee theory of the crime. 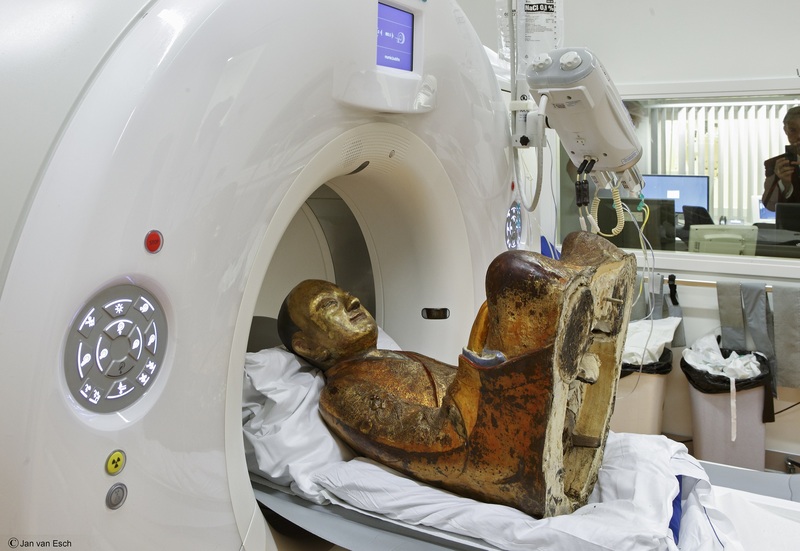 He was let go in 2011, officially due to restructuring, but possibly because he was suspected of theft. That can’t have been the source of his cleptorage, however. He may have stolen the Codex Calixtinus in July of 2011 out of pique, but he’d been making off with huge fistfuls of cash regularly for something like a decade by then. In his confession he said he was acting against the institution that had failed to offer him permanent employment, but he also hinted darkly that the lack of poverty and chastity from certain Cathedral personnel his poor, traumatized eyes had witnessed during his many years on the job drove him to a decade of thievery. The lack of chastity was homosexual, gasp, and the lack of poverty consisted in staff taking money out of the offering bag and helping themselves to the best donations of silverware, hams and fine wines. The Codex is now back at the Cathedral. It was returned on July 8th, 2012, four days after it was found in a garbage bag under some newspapers in Castiñeiras’ garage. It was on public display in the chapter house for the day, after which it was put in a safe location while the Cathedral looked into improving its obviously faulty security systems.